UK schools and other public service organisations are being encouraged to think seriously about modernisation,cultural change and remodelling their workforce. 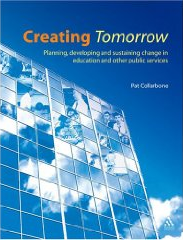 In this practical and insightful book, Dame Pat Collarbone shows organisations how to achieve this and provides strategies for making change sustainable for the future. In the last few years, remodelling has been taking place in UK schools and in local authorities, children’s centres, and locally based agencies and services that support young people. Many organisations have worked through the remodelling change process, but others need to and would benefit from doing so.